The German Shepherd Dog is an extraordinary dog with a long and rich history. For over a hundred years they have been known for their athleticism, intelligence, courage and loyalty. Whether as a therapy or service dog, a show or sport dog, or a beloved family member, a German Shepherd is a dog like no other. 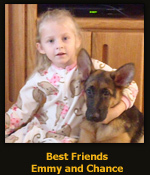 Hawkeye German Shepherds, located forty miles outside of Chicago, Illinois, specializes in breeding and importing only the finest German Shepherd Dogs from proven and highly respected German bloodlines. Our German Shepherd puppies are for sale to approved homes. As German Shepherd breeders we are committed to insuring our German Shepherd Dogs are raised and cared for with the same care and dedication that brought then into being. Hawkeye German Shepherds invites you to support our vision of continuing, through stringent and selective breeding practices, to preserve the drives, instincts, courage and heart that have made the German Shepherd Dog a legend in his service to mankind as war dogs, therapy dogs, service dogs, law enforcement K-9's and protectors of family and home. We invite you to contact us to inquire about our wonderful puppies and dogs. As German Shepherd breeders we firmly believe the dogs we create have the potential to touch others lives because of how profoundly they have touched our own. Puppies are here! Click here. Hawkeye Fizzara obtains Sch 1 title in Germany and returns to US. Hawkeye Extra wins 2nd place at North American Sieger Show in the 9-12 month class under German SV judge Henning Setzer.